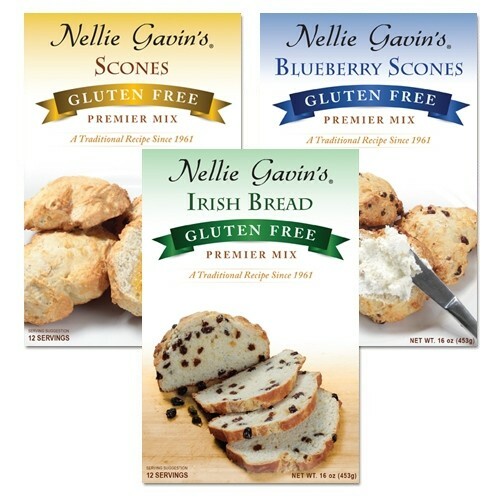 Gluten Free Variety Pack - Nellie Gavin's Inc.
Our Gluten Free Variety Pack of Nellie Gavin's Breads & Scones is perfect for health-conscious bakers. This value bundle includes 1 Gluten-Free Scone Mix, 1 Gluten-Free Blueberry Scone Mix, and 1 Gluten-Free Irish Bread Mix. Both our traditional scone and bread mixes has been passed down from generation to generation, providing a light, moist scone. Add Milk, Egg, Butter, Mix & Bake! Each Scone Mix makes 11 scones and the Bread Mix makes 12 Servings. Net weight 16oz each.